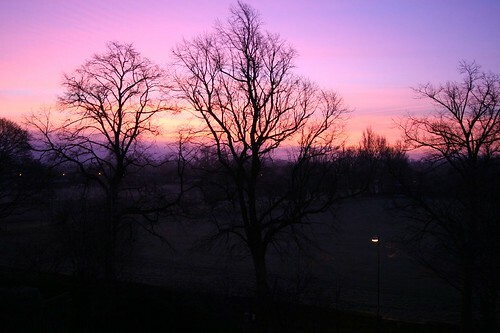 and man the world looked pretty today ..
that’s 7am in Ripon today, seriously is that just amazing or what ? Cool. I’m 2 hours away and everywhere has been covered in fog for 2 days. Looks good! Can it really be because of you..? Well, happy birthday! Well, someone has clearly made a few calls to be sure the lighting was favorable as your day began, yes? Wahey, i share my birthday with Dave Naylor, thats cool! That sunrise is sick. The best sunsets I have ever actually seen were in London (everyone always said it was b/c of the pollution and lack of actual sun) and they were amazing..
What the heck are you doing getting up at 7 am? Birthday boys should be sleeping late..
Did you get that VW? I had my 39th birthday a few days ago, next year it’s big party time. We are of the same sign, Sagittarius, and your blog is always in my blogroll list. Thanks for your posts and take care.